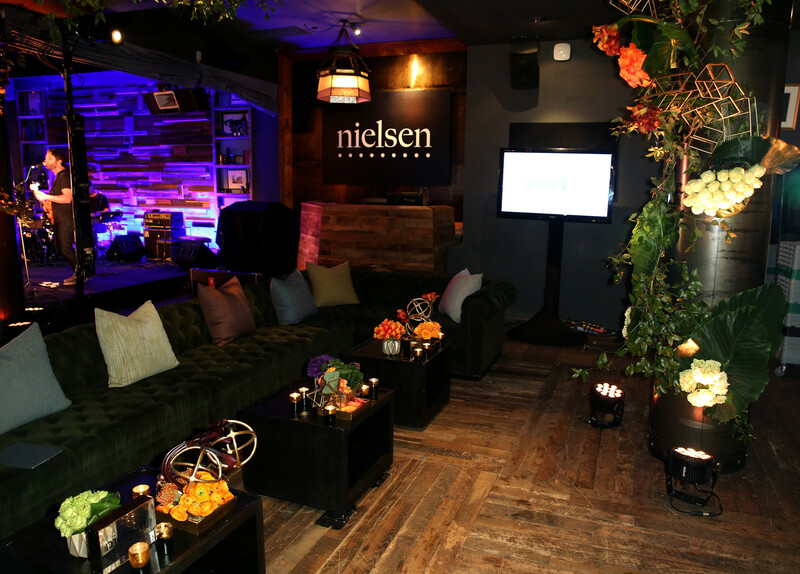 Nielsen hosted its third-annual pre-Grammy event on Feb. 14 for top industry executives, c-suite marketers and influencers with an evening of festive experiential touchpoints, networking, cocktails and food, and of course, really good music. 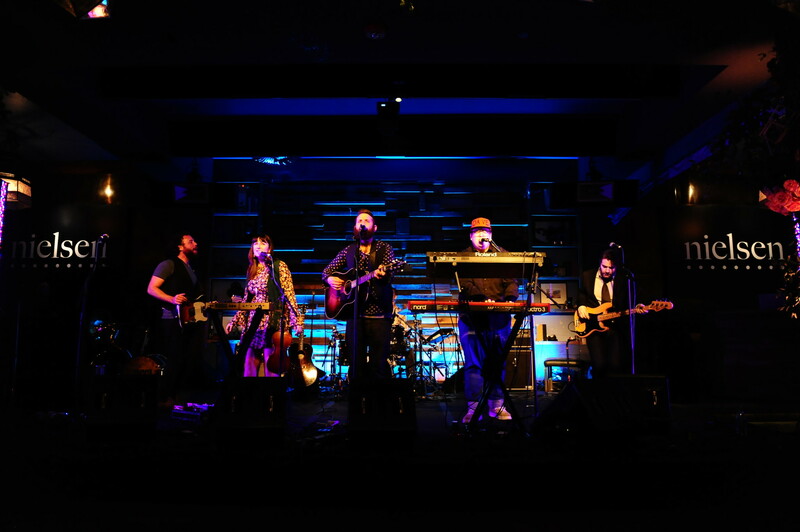 The event featured performances by emerging talent The Strumbellas, New Orleans’ Preservation Hall Jazz Band and Grammy-nominated soul singer Leon Bridges. 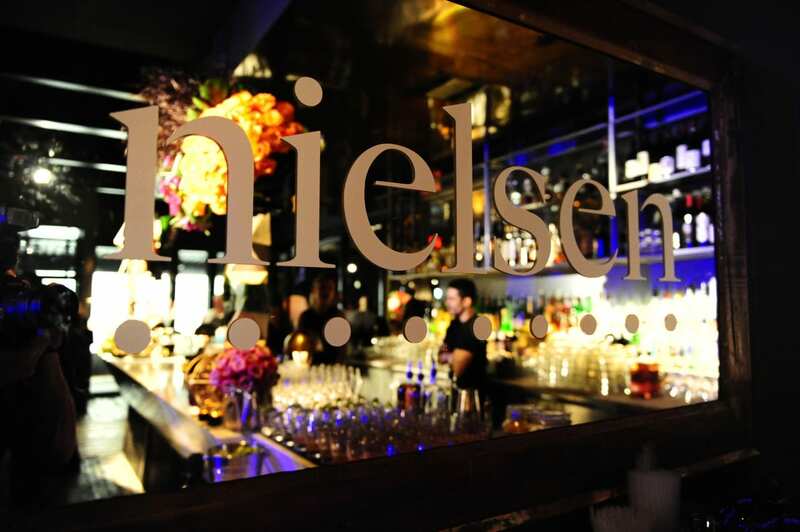 The space at Hyde nightclub in Los Angeles was transformed with a custom statement wall incorporating geometric shapes, Nielsen neon letters and brightly colored flowers. These bold themes popped up throughout the venue in art installations, hanging flowers and gold pendants. Since the event took place on Valentine’s Day, there was, appropriately, a chocolate fountain placed on a table surrounded by 60 pounds of candy hearts. 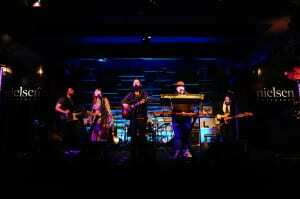 (You read that right.) 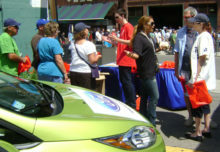 There were two signature cocktails as well: The Love Unit and Heart Express. 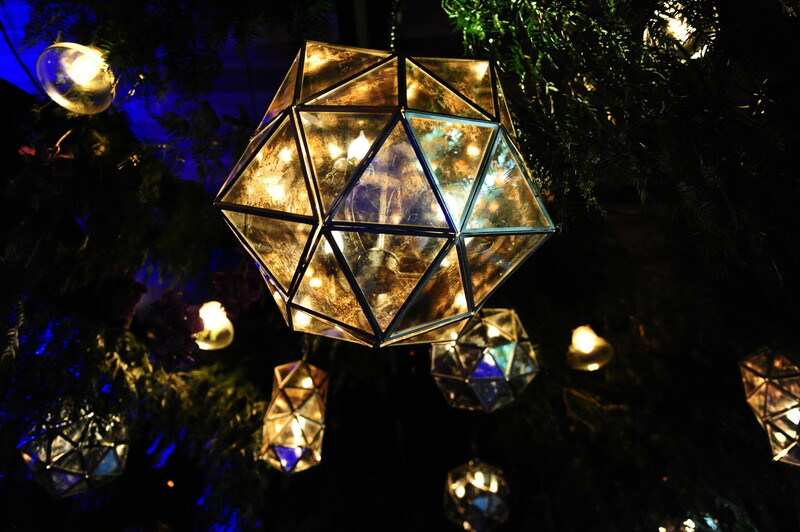 In addition to the sweets, there were food stations manned by chefs, and a raw bar featuring sushi and seafood against a backdrop of ice sculptures and decorative lobsters. 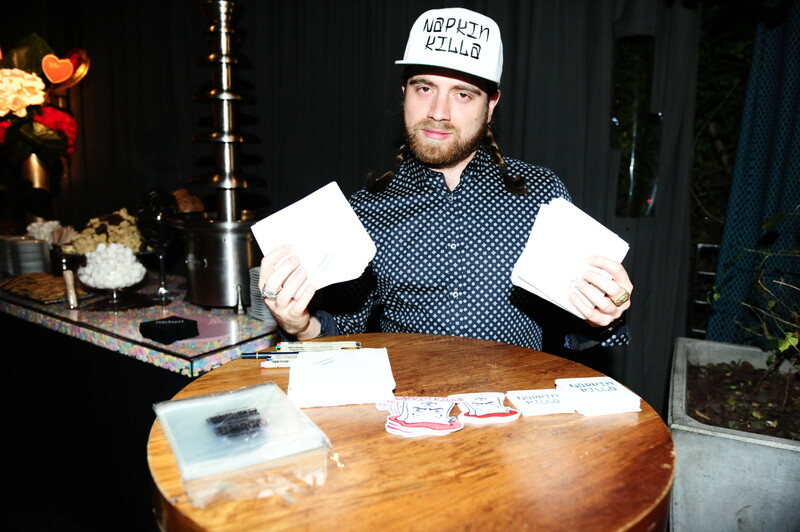 During the event, New York-based photographer Jean Andre captured images with his vintage Polaroid camera, and handed them to guests in a Nielsen-branded envelope. An additional Bosco photo booth was set up for guests to pose with various Valentine’s Day props and capture a moment in front of a Nielsen-branded backdrop. 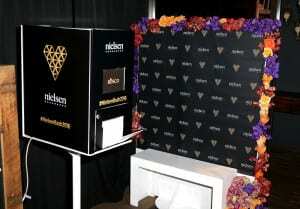 The booth snapped four images for a GIF which attendees could share via social media with the hashtag #NielsenBash2016 as well as print out as a take-away. 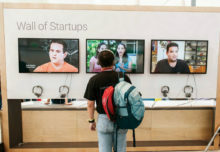 Art played a big role, too. 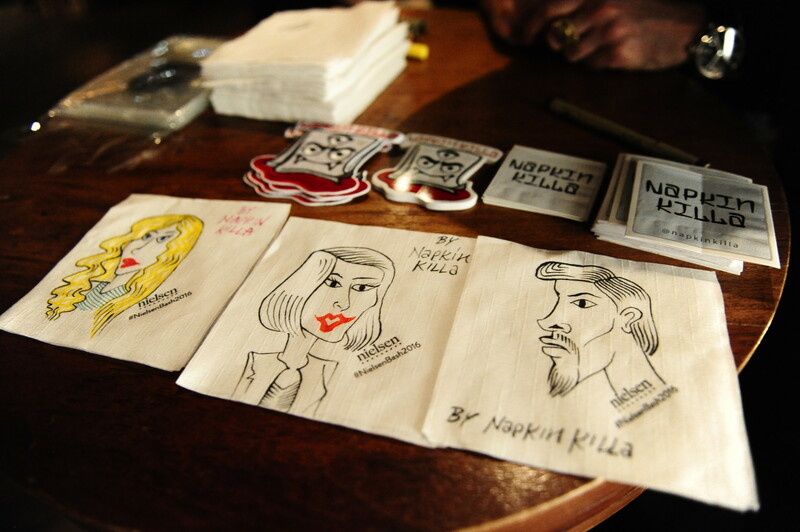 Attendees could receive a personal sketch from Brooklyn-based artist “Napkin Killa,” who created caricatures on Nielsen branded cocktail napkins. 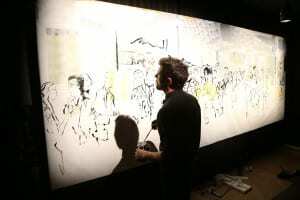 Nearby, British illustrator Blue Logan captured the scene of the event through a 16-foot mural that was displayed in a prime location for guests to check out as the event progressed. The mural doubled as a backdrop for photos as guests took photos in front of the artwork throughout the night. 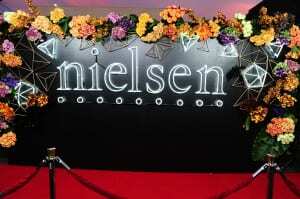 And in a philanthropic twist, Nielsen made a donation to GLAAD in lieu of gift bags. 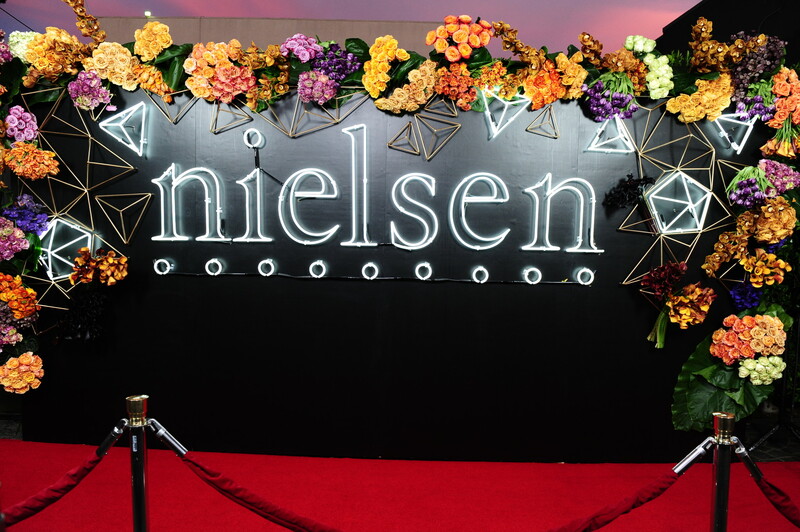 “We’re a measurement and insights company that covers the media business, the entertainment business, the CPG world, and retail, all of these constituencies that Nielsen keeps tracks of,” says Howard Applebaum, president of entertainment at Nielsen. “So we’re uniquely qualified, and this event is a unique opportunity for us, to connect the entertainment part of the world with the media part of the world and the CPG brand part of the world, and to bring everybody together to have a forum to mingle and talk about their businesses and make connections.” Agency: MAC Presents, New York City.